This past week, Hagridden‘s publisher, Columbus Press, put the call out for photos of my novel out in the world for Fall/Halloween — readers in costume with the book, or the book in scary locations, or the book in Fall scenery . . . . We got a lot of great photos from all you saintly readers, and now, on All Saint’s Day, I can share one more batch — and introduce you at last to the Rougarou! Another moody Hagridden photo from Columbus, OH! I was feeling left out, so my wife and I took Hagridden down to Mill Ends Park in Portland. 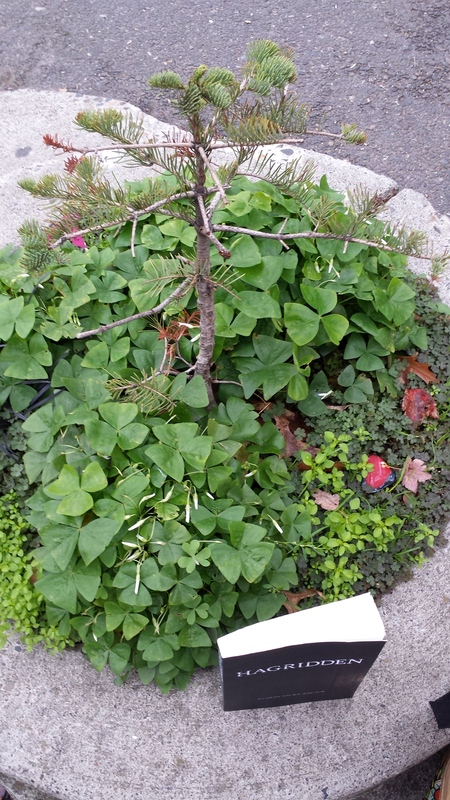 At less than two square feet, it’s the world’s smallest municipal park, and it has played host to all manner of charming mythical creatures, from leprechauns and gnomes to the Easter Bunny. 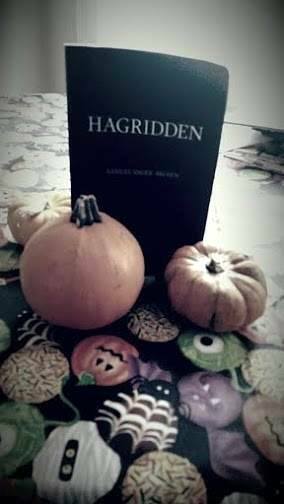 So Hagridden felt at home. 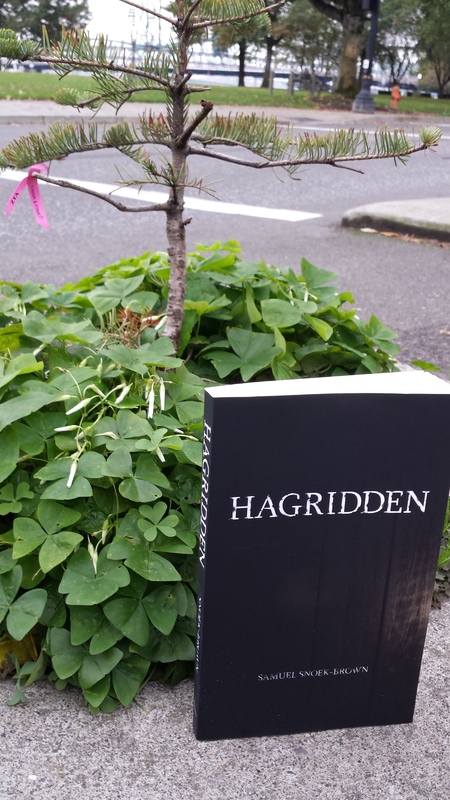 Hagridden in Mill Ends Park, Portland, OR. Seriously, this is a TINY park! 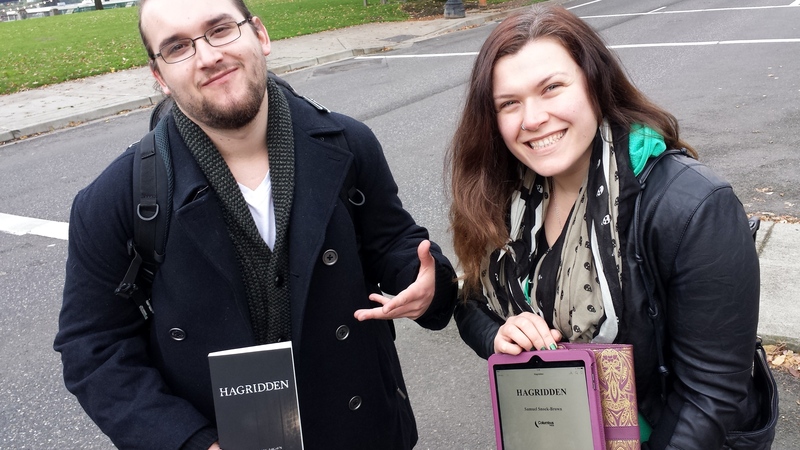 This weekend, we also hosted my cousins from Scotland, and since they’d just finished reading Hagridden on their way to Portland, we got photos of them with the book, too — including the first-ever photo of the ebook Hagridden on an iPad! 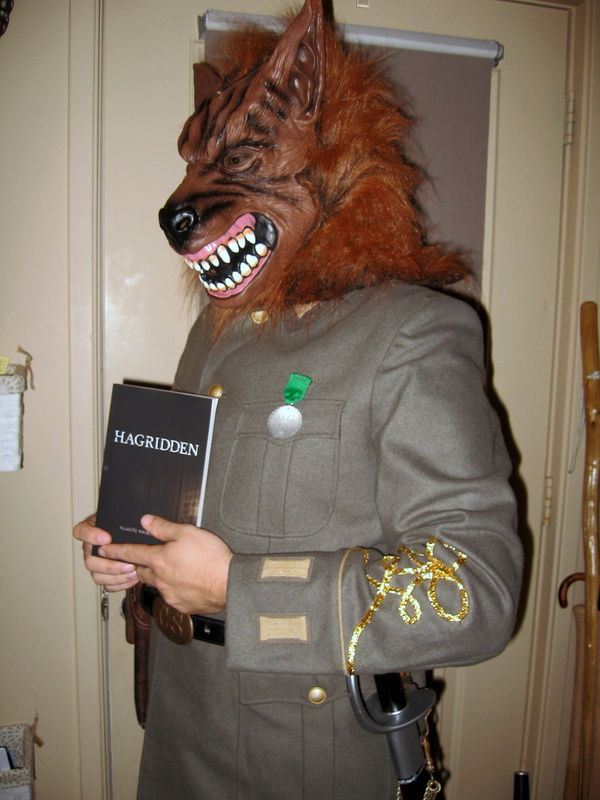 Lauchlan and Shannon M. with two versions of Hagridden. 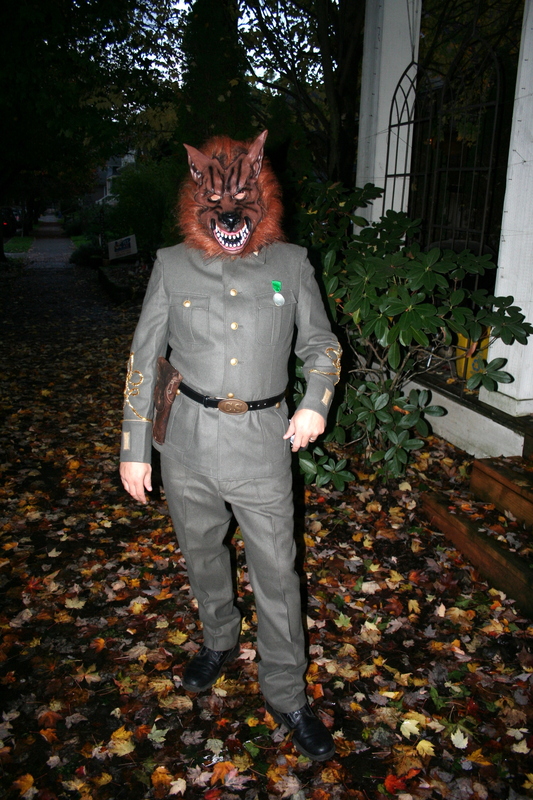 And, of course, because it was Halloween, we also hosted . . . . 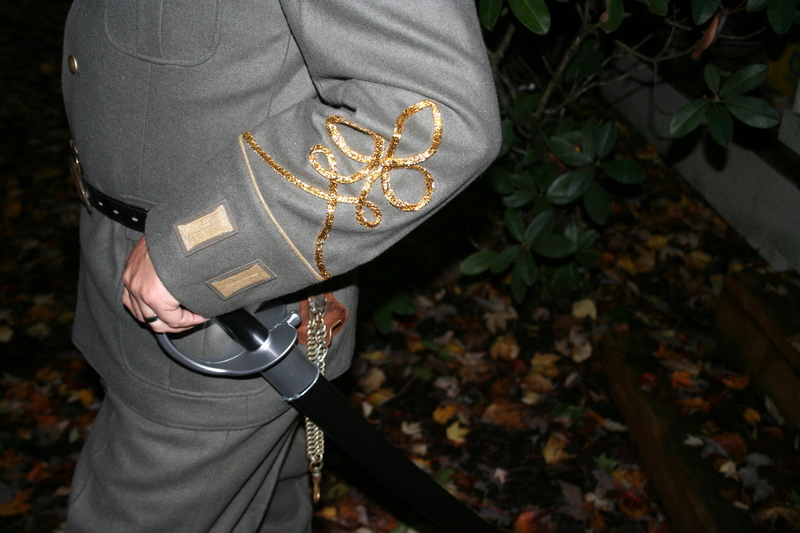 This was my Halloween costume, complete with gold-braid “chicken guts” on the sleeves and the Davis Guard medal on the chest! He wore his uniform crisply laundered and bright gray despite the few missing buttons. On his breast the coin medal newly polished. My wife made the “chicken guts” on the sleeves. I do like me that coat. [Clovis] pointed to the cuffs, the corded brocade there. Them chicken guts look right smart and that medal hanging there, that genuine? 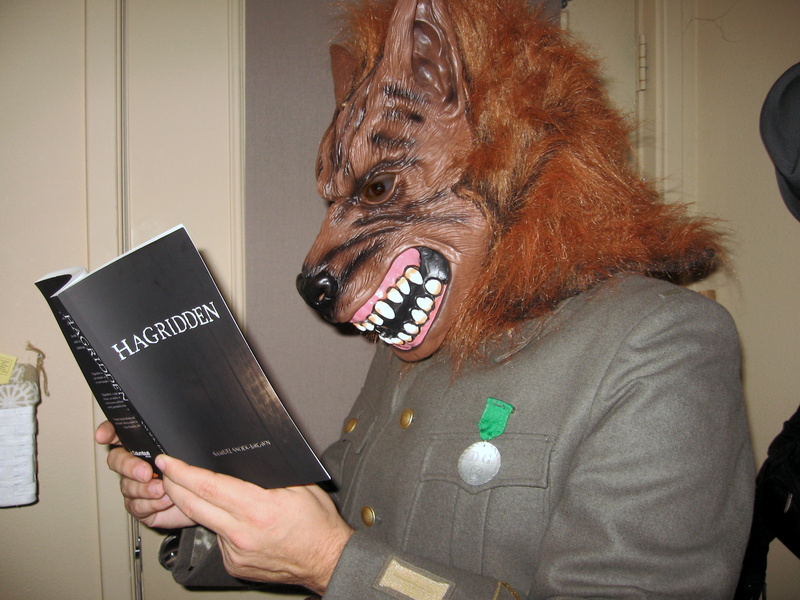 He particularly enjoyed chapter 15, which describes how he makes his wolf mask — his true face. Reading the chapter about making the wolf mask! And don’t forget about the Goodreads giveaway!